Design Your Own Eiderdown Using Photos. Handmade In London, UK. Give your bed a gorgeous update with a personalised eiderdown. Handmade at the Bags of Love studio in London, this luxurious eiderdown is the perfect way to add style, comfort, and love to the most important room in your house; your bedroom. Your photos and designs are printed onto luxurious Duchess satin, which looks and feels elegant, smooth, and soft. Your eiderdown is filled with thick and cosy padding that will keep you warm on cold nights. Available in your choice of seven sizes and three different colour options for the back. Design one for yourself or give one as a gift that they quite simply will never forget. An eiderdown is a timeless piece of bedding that will never go out of style. They make wonderful gifts and keepsakes that can be handed down the generations, and with our expert craftsmanship, you can be sure that they will stand the test of time. There is nothing quite like getting into your warm bed at the end of a long and tiring day. The only thing that can make it even better? By adding a gorgeous eiderdown that has been designed by you and handmade by us. Create a personalised eiderdown with Bags of Love and enjoy an added touch of luxury, comfort, and personality to your bed. Not only are eiderdowns a functional piece of bedding, but they are also decorative, making them perfect for creating your own personal style in your bedroom. Every personalised eiderdown is handmade to order in London by our team of skilled printers and seamstresses. Made from soft and silky Duchess satin, your eiderdown is filled with sumptuously soft padding, before being expertly sewn together. You can print one photo or a whole montage of photos onto the front of your quilt, and then choose from three colours to complete the back. Cot, crib, mini lap - 70 cm x 110 cm or 27" x 43"
Lap, sofa comforter - 100 cm x 100 cm or 39" x 39"
Classic single - 135 cm x 200 cm or 53" x 78"
Double - 200 cm x 200 cm or 78" x 78"
King - 220 cm x 220 cm or 86" x 86"
Super King - 260 cm x 220 cm 102" x 86"
Care: We recommend dry cleaning only. Do not put your eiderdown in the washing machine or tumble dryer. You can surface wash with mild soapy water and a soft sponge. Follow these care instructions and your custom made eiderdown will last a lifetime. What Will My Eiderdown Look Like? Your new personalised eiderdown is a thing of beauty and expert craftsmanship. Eiderdowns have been a popular bedspread option for centuries, and the trend for comfort, warmth and style shows no signs of slowing down. Once you have selected the size of your eiderdown, you can start designing it. Opt for a single photo, a scattering or even a whole photo montage. You can add text and even artwork to make it even more special. Our team of print technicians quality check each image you submit to ensure it will look its best when printed on the smooth and luxurious satin fabric. The ink is fused into the fibres of the fabric, ensuring a striking print that will not crack or peel. Once you have chosen the colour for the back of your custom made eiderdown, the two pieces of fabric are sewn together using traditional quilting techniques. Mitred corners are added to create the border and the inside is filled with a super soft padding. The end result is a purely customised eiderdown made with exceptional skill and craftsmanship. It is important to take into consideration the size of the eiderdown you select when creating your design. 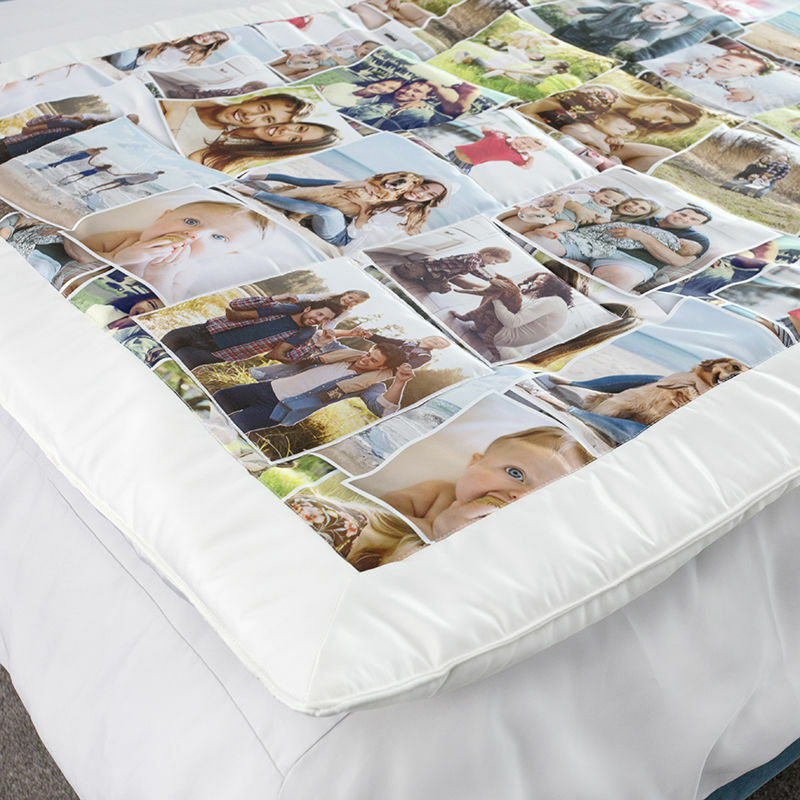 If you want to make a photo montage featuring lots of photos with small details, then a larger sized eiderdown is a better choice. When you print on Duchess satin, the final result is a stunning, slightly soft finish, which adds a romantic aesthetic. Keep this in mind if you want to choose images with very small, fine details. Another design tip is the colour you select for the backing. The colour that you choose (ivory, lilac or pink) will also be used to create the border for the front, so make sure you select a colour that will complement your design.